“Please bring a special item to class with a write up on it.” A simple request from Brian, my creative writing instructor during the first class. 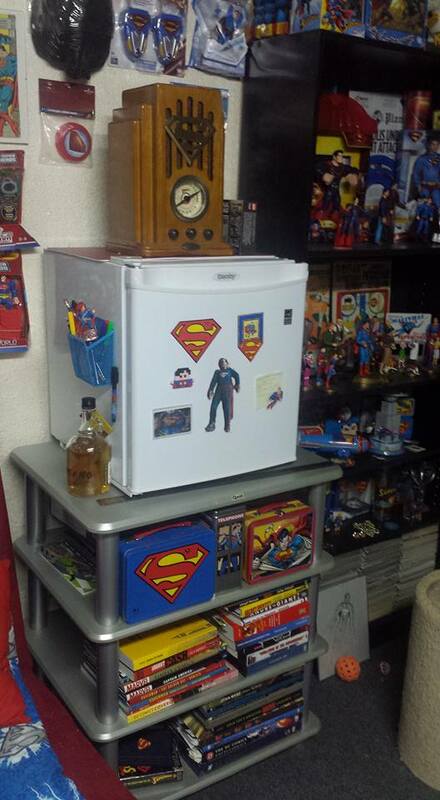 A simple task indeed unless you happen to be a collector of Superman toys and other memorabilia. It started twenty years ago, as a joke with some college friends over a few toys from Burger King Kids Meals that were sitting on my television set. That joke has turned into a collection that is currently comprised of nine-hundred and thirteen items all related to the famed comic book character. This number of collectibles can be verified because I have made an archived list for insurance reasons. This list also comes in handy when I go to shops and conventions when I'm not sure if I already bought a particular coffee mug or not. 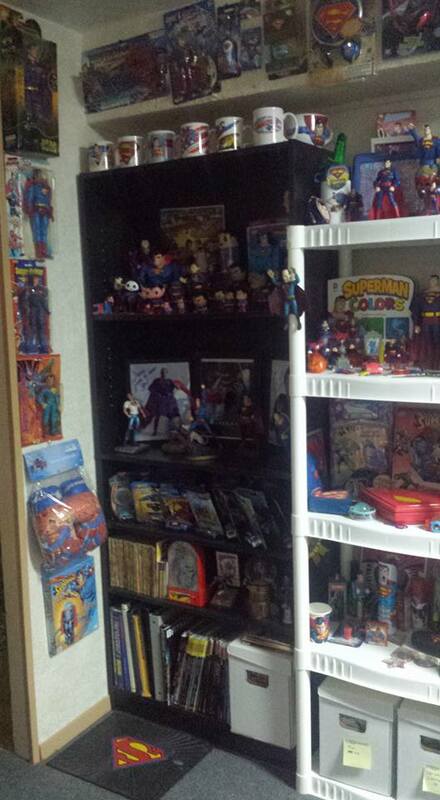 In my meticulously curated assortment, you will find autographs, action figures, games and more. There is even a toaster that burns the famous ‘S’ symbol onto the bread and an air sickness bag. The collection rests in our basement rec room, hallway and restroom. There is a promise that I made to my wife that no Superman artifacts (or any other comic character for that matter) is to be displayed beyond the stairway leading downwards. This was easily accepted as I was surprised she let me get this far. The area has a few titles: Nerdvana, the Fortress of Solitude and Stately Duane Manor. Some are purchases from various stores, flea markets and conventions. Other items are generous gifts from family and friends. Not all are highly valuable but are equally precious and are affectionately displayed. In the weeks following that first class I repeatedly scanned through the over nine hundred items displayed in our basement in an effort to select one key artifact of which I could bring with a written story on it. A tough decision, as many are special for different reasons. Some are just odd creations, some have some relevance to pop culture history, while others stir feelings of nostalgia or sentimentality. As Valentine’s Day and my next class were scheduled on the same date, it caused some concern. Attention would need to be divided between my continuing studies and celebrating the occasion with my dear wife. With superhuman inspiration, I found one such item in my collection to assist with both of my pursuits. My wife and I concluded I would have to leave to attend my class very soon after she got in the door after work. This would leave little or no quality of time to spend with each other. So we agreed to postpone our romantic evening to a later time when we wouldn’t be rushed. Before leaving in the morning, I set the dinner table, left a prepared meal in the refrigerator that could be easily reheated in the microwave and some cards and gifts for her to open. There was even a Valentine’s card from the cats. I still felt a pang of guilt in my chest that I might be abandoning her on this occasion. This notion had to be set aside in order to again attempt select an item from my Superman collection to bring the evening’s class. I arrived at the bottom of basement stairs and there it was staring at me. Really, the stupid thing was staring at me. 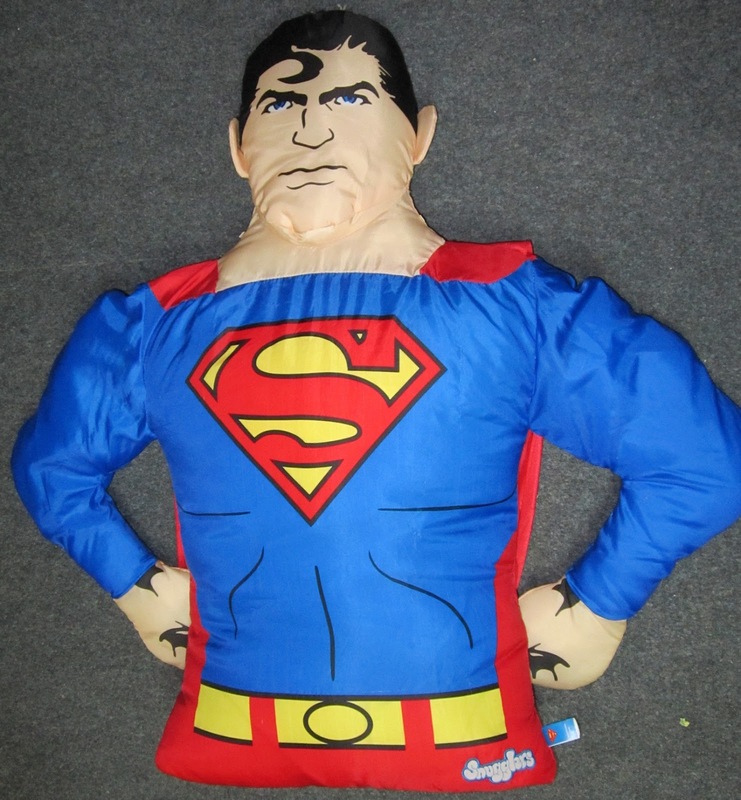 A Superman ‘Snuggable’ is a covering that you pull over a bed pillow. Afterwards, it becomes a plush, near life size replica of the superhero from the waist up. I propped it in the dining room chair where I normally sit for meals. A place setting was made, in front were some modest gifts from me to my wife for her to open. Affixed to the wine glass, a sticky-note was placed with the message: “He’s here in place of me, love Duane,” followed by a tiny scribbled heart. Now my dear wife would not feel as alone during the meal and through-out the evening. The Superman Snuggable could also keep her company while watching her favourite television programs and even in bed until I got home from the class. I was proud that I found a way to make my wife’s time alone a little less lonely. Prior to today, the Superman Snuggable was not considered as an item ranking among the upper echelon of my collection. Today it was promoted to the esteemed role of substitute Valentine’s Day date and husband. Flying in a single bound from its basement boundaries to dining and living room areas of our humble home. A veritable savior to a lonely damsel in distress in her time of need. The shiny polyester will gleam by candle light if my wife chooses to light one. Hopefully not too close as it is flammable. Tomorrow, it will be returned to its rightful spot in the basement collection with my gratitude. My next choice for a special item to write about will be the living room sofa. It has nothing to do with Superman but is where I will be sleeping for the next couple of nights. I am considering putting the Superman Snuggable on EBay. Duane Wiggins (aka Wiggy to some) began writing as an adolescent but has been told his printing is easier to read. The bulk of his work consisted of reports, carefully written emails to avoid getting fired, and more recently resumes and cover letters (guess he was not careful enough). Imaginative contributions included writer and artist onWeapons Willy (Pull My Finger Comics) in 2000 and Return of the Sidekick (Battle Royale) in 2002. 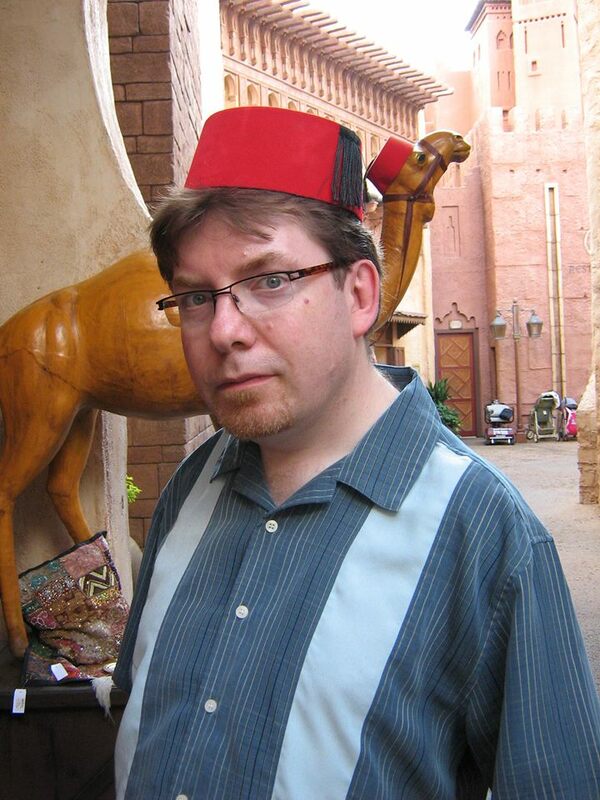 Duane currently lives in Mississauga, Ontario, with his wife, two brilliant goldfish, two stupid cats and a pile of comic books.